The terrorist Duterte regime | Fight Back! 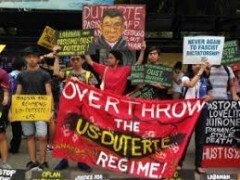 Rodrigo Duterte has recently threatened to unleash his military’s air power against the New People’s Army (NPA), dismissing the possibility of civilian casualties as “part of the territory.” On August 27, his soldiers launched an aerial strike near a Lumad school in Talaingod, Davao del Norte while students were playing outside of their classrooms. It was not the first time for Duterte to declare his contempt for the rights, welfare and safety of civilians. He had earlier ordered aerial bombings to “level the hills” and threatened to bomb the Lumad schools. In Marawi, he made good his threat of using deadly air strikes against his perceived enemies, razing the city to the ground and causing up to a thousand civilian casualties, according to independent sources. Under Duterte, the human rights watchdog Karapatan has reported a total of 356,964 individuals victimized by aerial bombings and artillery attacks. And yet, this brutal regime, whose two years in power have been called a calamity for human rights, dares to brand as terrorist the Communist Party of the Philippines (CPP) and NPA which are revolutionary organizations enjoying the people’s widespread support. The CPP and NPA have been waging a legitimate social liberation movement against the oppressive and exploitative ruling system and have formally adhered to International Humanitarian Law (IHL) on the rules of war and especially on the protection of civilians and non-combatants. Unlike the Duterte regime which has no qualms about targeting civilians, the NPA trains its weapons only at the state’s military, paramilitary and police forces and other armed groups utilized by the state to suppress the people. The revolutionary forces led by the CPP have been advancing the interests of workers, the peasantry and other exploited and oppressed sectors. Through the National Democratic Front of the Philippines (NDFP), the revolutionary movement has put forward a comprehensive socio-economic reform program aimed at resolving mass poverty and creating sustained employment by way of genuine agrarian reform and national industrialization. In vast areas of the countryside, the CPP and NPA provide venues for the exercise of democratic people’s power by organizing revolutionary mass organizations of peasants, women and the youth and setting up local organs of political power. They help eliminate usury, reduce exorbitant land rent and raise production and farmers’ incomes through revolutionary land reform. The NPA and the revolutionary mass organizations have also been instrumental in providing basic health care and literacy and numeracy training in areas severely neglected by the reactionary government. The case filed by the Department of Justice in a Manila court last February to formally proscribe the CPP and NPA as “terrorist” organizations forms part of the regime’s attempt to strip the Philippine revolutionary movement of legitimacy and recognition as a national liberation movement, thereby denying it and any suspected revolutionary of their rights and protection under International Humanitarian Law and other instruments governing armed conflicts. At the same time, it is a desperate attempt by the Duterte regime to divert attention from its own sordid human rights record. If to be terrorist is to systematically use armed violence against civilians and other non-combatants, then it is Duterte and his fascist forces who answer to this name. As soon as Duterte came to power, his death squads began a campaign of mass terror by killing suspected drug users and street-level pushers mostly in urban slums. His so-called war on drugs, which has already killed more than 25,000 people, has been stepped up and is now being mounted with such ferocious regularity by “riding in tandem” vigilantes. The Duterte regime’s campaign to vilify and criminalize the revolutionary movement deliberately involves the Red- and terror-tagging of legal organizations and activists, thereby casting a wide net of repression and murder. By Duterte’s second year as president, his fascist minions had killed 163 peasant and Lumad mass leaders and activists. Another 351 had become victims of frustrated extrajudicial killings. The Duterte regime is intent on intensifying the extrajudicial killings of political activists begun in 2003 under the Arroyo regime’s Oplan Lambat Laya. Working hand in glove with Duterte’s death squads is the Inter-Agency Committee on Legal Action (IACoLA) formed last October. This agency, like its predecessor, the Inter-Agency Legal Action Group (IALAG) under Gloria Arroyo, specializes in manufacturing criminal cases against revolutionaries as well as progressive leaders and activists who are being linked to the CPP-NPA. To date, about a thousand mass leaders, activists and suspected members of the CPP and NPA nationwide have been slapped with trumped-up criminal cases, more than 700 of them under the Duterte regime. About 200 of the 503 political prisoners currently languishing in various detention centers across the country have been arrested by the Duterte regime on similarly fabricated, baseless and absurd charges. By formally proscribing as terrorist the CPP and the NPA, the Duterte regime wants to cloak its escalating counterrevolutionary war with the mantle of legality. It wants to imbue with legitimacy the widespread political killings, illegal arrests and detention and attacks against civilians and other unarmed adversaries and strip the victims of all possible means of redress.